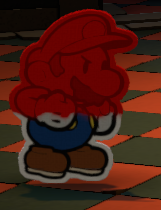 Rage is a status effect in Paper Mario: Color Splash, inflicted only by red paint in the battle with Roy. Similar to the Heavy G status in Mario & Luigi: Superstar Saga and its remake, while Mario is in this state, his action command speeds up, lessening the input window for attacks. Like all other status effects exclusive to said battle, the effect is temporary and only lasts one turn.